Shopping for the right garage door can become an overwhelming task, especially if you are not familiar with what to look for. In addition to this, there are numerous door style options available in the market. While choosing the right door style, you need to consider the three main choices. This style was crafted over a century ago. This was previously used in a carriage house that served as a garage to those who owned horses and buggies. This door style features swing-out and side-hinged heavy double doors. These doors serve as the entryway. Today, however, door makers have latched on the classic look of the carriage house and this style now comes with custom colors, windows and trims. With these additional features, homeowners have a chance to customize the look of their homes. Carriage house doors reflect the classic style of the past, but this can be paired with modern door accessories and systems. Contemporary doors are created based on modern architectural styles. If you want something different, this may be the door style for you. Contemporary doors can come in combinations of glass and aluminum, wood and zinc, wood and steel, and wood and copper. 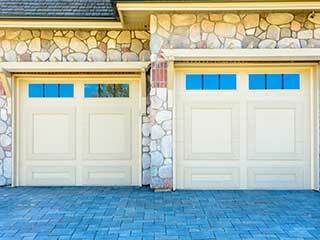 Regardless of the combination you choose, this garage door style can give your home that sleek and smart look. Raised panel doors have become an American classic, as this offers a timeless design. In addition, this style is sturdy and reliable. Today, however, you can modify a raised panel door, according to your needs and preferences. There are new wood designs of this door style that come with custom windows, which can easily enhance the look of the entryway to your garage. This style also comes in fiberglass or other composite materials. With these material variations, your door becomes resistant to dents. Moreover, they also come in stunning textures, which can be painted or stained to match the trim colors of your home.